Revolution of Alice Cullen's Hair. . HD Wallpaper and background images in the 해리 포터 대 트와일라잇 club tagged: twilight alice hair revolution new moon eclipse breaking dawn series. This 해리 포터 대 트와일라잇 fan art contains 초상화, 얼굴, 근접 촬영, 얼굴 만, 세로, and 헤드샷. 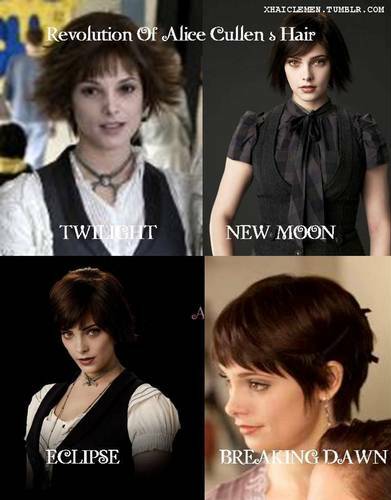 I like her Twilight and Breaking Dawn hair the best. Omgomg are we soule mates? I feel so bad for you, this is like the 3rd one!